Cherries are the Secret Little Rubies of Health. Cherry fruit, a sweet round small balls with the cheerful color red. They are so versatile they can be frozen, dried, canned and still keep that great and unique cherry taste. 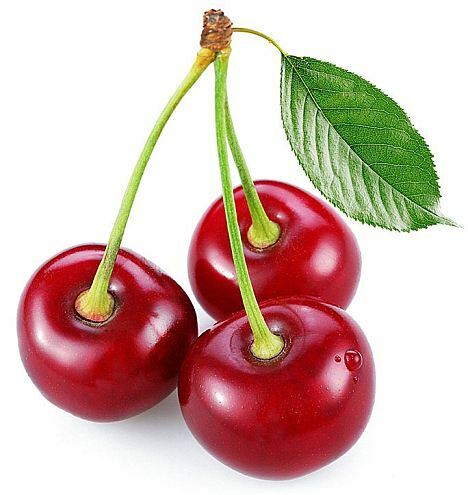 Here on these page we will see different health benefits of cherries. Thry are also an excellent source of potassium, vitamin A and vitamin C and an ample amount of fiber. They come in two basic types – sweet and sour. The varieties of sweet cherries include Rainier, Lambert, and Bing. A cherry is made up of more than 75 percent water. This water content makes them a perfect weight loss food as foods that are high in water and low in calories keep you feeling fuller for a longer period of time than foods and drinks that are higher in calories. They are also loaded with fiber, at almost 3 grams per serving. This fiber helps accelerate weight loss and reduces your cholesterol levels by slowing its absorption into your blood. Eating them can help you lose weight and stay trim. Also, these little beauties contain many B-vitamins such as thiamine, riboflavin, and vitamin B6; these vitamins are crucial for metabolism and convert nutrients into energy. Researchers found rats that were fed whole tart cherry powder, in a high fat diet, didn’t gain much weight. In a study conducted on rats few years back, the rats that received whole tart cherry powder for 90 days, mixed into a high-fat diet, didn’t gain as much weight or build up as much body fat as rats that didn’t receive cherries. Tart cherry intake was associated with reduced concentration of fats in the blood, percentage fat mass and abdominal fat weight. Cherries can help reduce overall fat mass and specifically weight around the abdominal region. The rats blood showed much lower levels of inflammation, which has been linked to diseases like heart disease and diabetes. So, by consuming tart cherry juice, or a cherry supplement, you can reduce inflammation and lipids in the blood, which lead to heart conditions and weight gain. Cherries reduce inflammation which can help with weight loss. Inflammation can cause digestive issues that not only can lead to weight gain but can cause other more serious issues like cancers. Cherries are fiber-rich, which helps boost satiety for overall calorie control. Adding cherries to your meal plan, however, isn’t a guarantee you’ll lose weight, especially if you’re eating too many calories over the course of the day. 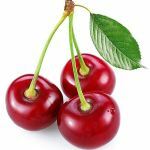 Health Benefits of Cherries – Children love the taste of it. But did you know that it is a very grown-up fruit? They pack a whole lot of nutrition into a tiny little red gem of a fruit. We’ve all heard that any food containing antioxidants is filled with cell-strengthening goodness. They are rich in two types of antioxidants; anthocyanidins, which bolster antioxidant defenses and; quercetin, which is believed to regulate blood pressure. Study after study is showing the health benefits of cherries and its nutrition facts. Sweet-cherries have a lower glycemic index of 22, lower than apricots (57), grapes (46), peaches (42), blueberries (40) or plums. This makes them a better choice of a fruit snack compared with many other fruits, especially for diabetics. Health Benefits of Cherries – They are very high in potassium, which helps regulate heart rate and blood pressure and reduces the risk of hypertension. The phytosterols in it help reduce bad cholesterol levels. Tart-cherries provide cardiovascular benefits. The anthocyanins, which are the pigments giving a them there red color, may activate PPAR which regulates genes involved in fat and glucose metabolism and thus, reduce risk factors for high cholesterol, blood pressure and diabetes. – Research University of Michigan System. They contain substances known as anthocyanins – purple and blue pigments that give them their color. These compounds reduce pain related to inflammation, according to the NYU Langone Medical Center. They are also used to relieve the pain associated with arthritis and gout, and contain boron, which helps increase bone strength when consumed in conjunction with magnesium and calcium.